INCOE’s Back-To-Back design eliminates the offset requirement found on standard valve gate systems. The design can reduce costs for mold construction and offers a compact size. With a smaller mold size, a reduced machine size may be realized. 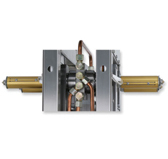 Back-To-Back systems utilize the DFQ nozzle design featuring a threaded base which screws directly into the manifold.